Marozzo’s Sword & Dagger system is a highly effective and extremely versatile one. The system relies on a promary base guardia position, from which we are shown the majority of the plays. The remaining parts of the system are describing following actions made form the guardie which you have moved to from the base guardia. For ease of interpretation, I have grouped the plays under their starting guardia, which is named for the sword position being used. Gather forward with the right foot, and stepping forward with the left, throw a rising falso to the sword or dagger hand. This will also protect you from an attack to the head or leg. Throw a probing stocadella to see if you can draw a response from the enemy. If the enemy does not respond, pass right and throw a falso dritto to the dagger hand, ending with the sword in Coda Lunga Stretta, and the dagger in Guardia di Testa. When the enemy throws a mandritto at the head, step forward with the right foot and parry with Guardia d’Alicorno, simultaneously attacking to the flanks with the dagger. Riposte by passing back with the right foot whilst throwing a mandritto fendente, ending with the sword in Cinghiara Porta di Ferro, and the dagger in Guardia di Testa. When the enemy attacks you, parry the blow with the true edge of your dagger and simultaneously traverse right with your right foot. Riposte with a strong thrust to the flank or a mezzo mandritto to the leg. For your defence, as the left leg comes behind to complete the traverse, throw a riverso molinello, and then pass back with the right foot, ending with the sword in Coda Lunga Alta, and your dagger in Porta di Ferro Stretta. When the enemy throws a mandritto to the leg, pass right and parry the sword with the true edge of your dagger, turning the point down. Simultaneously throw a mandritto to his leg, ending in Porta di Ferro Larga with the sword, and Guardia di Testa with the dagger. When the enemy counterattacks with a mandritto to your leg, slip back your right foot bringing your sword to you left hip, and then turning through with a riverso squalembrato (bind to seconde) to clear the enemy’s sword as you step back with the right, ending with the sword in Coda Lunga Alta, and your dagger in Porta di Ferro Stretta. Defence 2 – a false edge dagger parry: – In stresso tempo on a pass right, parry with false edge of dagger without turning the hand, and simultaneously riposte with thrust or a mandritto to the head or leg. Defence 3 – a counterattack to the sword arm: – Traverse right with right foot using the pivoting step cutting with a mandritto traversato to the sword arm, ending with the sword in Cingiaria Porta di Ferro, and the dagger in Guardia di Testa. Parry with false edge of sword (probably a prime parade) and riposte on a pass right with a fendente to the head, ending with RH in Porta di Ferro Stretta and LH in Guardia di Testa. Redouble with a thrust to the face under your dagger, passing back into RH Coda Lunga Alta, LH Porta di Ferro Alta. Slip the left foot back to the right, then riposte with a riverso the leg on a step right, ending with RH in Coda Lunga Stretta and LH in Guardia di Testa. Harass with a rising falso. If he responds with riverso to head or leg, parry with true edge of dagger, point towards the ground. Riposte with a riverso to the head on a step right, ending with RH in Coda Lunga Distesa and LH in Guardia di Testa. Redouble with a falso or thrust, passing back into RH Coda Lunga Alta, LH Porta di Ferro Alta. Parry with true edge of dagger by turning hand into Coda Lunga Stretta. Riposte with a thrust to the chest or a half mandritto to the leg on a step right. Take 2 or 3 steps back to get out of range. Defence 1) Parry with sword using a falso (dagger hand probably covers the redirection), and riposte with a riverso segarai to the leg, with the dagger going to Guardia di Testa. Defence 2) On a pass back, parry with a falso from below upwards. If the enemy responds to the Elza e Tira with a mandritto or fendente to the head, traverse right with the right foot and counter his strike with Guardia di Testa. Redouble with a traverse left, throwing mandritto with the dagger and riverso with the sword, ending with the sword in Coda Lunga Distesa, and your dagger in Porta di Ferro Alta. Watch carefully for the enemy may attack with a thrust or mandritto imbroccata. When the enemy throws a blow to the head (mandritto, roverso or stoccata), parry with your sword using a rising falso beat, and then riposte with a mandritto to the leg. Redouble with roverso, preferably to the sword arm, made with small step forward with the right foot. For your defence pass back with the right foot ending in Coda Lunga Alta with the sword and Porta di Ferro Stretta with the dagger. When the enemy throws a thrust high or low, traverse right with the right foot and parry with a falso, riposte with a riverso to the leg. Riposte by passing back with the right foot whilst throwing a falso dritto, ending with the sword in Coda Lunga Alta, and the dagger in Porta di Ferro Alta. When the enemy throws an attack, pass forward with the right foot, and parry with a rising falso, ending with the sword in Porta di Ferro Stretta, and your dagger in Guardia di Testa, with your arms facing the right side of your enemy. When the enemy throws a mandritto or riverso to your head or leg, or a thrust to the face, pass back to your right with the right foot, and parry with a mandritto traversato, ending with the sword in Cinghiara Porta di Ferro Stretta, and your dagger in Guardia di Testa. Throw a mezzo mandritto to the dagger hand to draw a response. When the enemy attacks you, parry the blow with your dagger and throw a blow to the head made whilst stepping forward and left with your right foot. 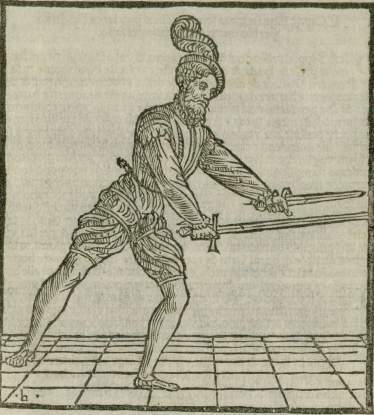 Redouble with a riverso to the sword leg (traversing left with the left foot), and then back with the right foot, extending a stoccata to the face under your dagger, ending with the sword in Coda Lunga Alta, and your dagger in Porta di Ferro Stretta. Feel out the enemy’s response with a falso to either hand as you make a gathering step. If the enemy throws a thrust or mandritto imbroccata at the head or leg, traverse right throwing a falso traversato to the arm or hand, or a riverso voltato that turns under in the fashion of a molinello (turning to your outside, which will then come under opponent’s sword), ending with the sword in Coda Lunga Stretta, and your dagger in Guardia di Testa.